CAFG was formed in 1978 to carry out practical archaeology in the Cambridge area. We also promote interest in archaeology through activities such as talks. Membership is open to all with an interest in archaeology and local history - no expertise is needed to join. Members take part in as much or as little of the Group's activities as they wish. Fieldwalking - Sunday mornings from autumn to spring. Excavations - we try to undertake some excavation during the summer months. Processing and finds analysis - throughout the year on Wednesday evenings (except for lecture evenings) at the Oxford Archaeology East premises, Unit 15, Trafalgar Way, Bar Hill. Talks - on the first Wednesday in the month from October to June in the seminar room of the McDonald Institute for Archaeological Research, Downing Street, Cambridge at 7.30 pm. These are open to the public. On the Wimpole Hall estate, we are researching the projected outfall from Johnson's Pond, thought to be the reservoir for the long-demolished earlier 18th century fountain behind the Hall. 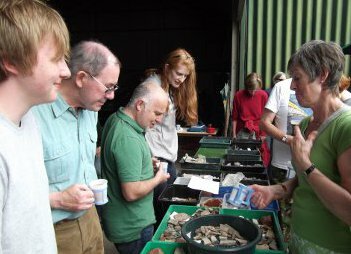 Each year the Group tries to encourage interest in archaeology by offering up to £150 towards fees for attending an archaeology training course or or for buying relevant equipment or books. Applicants are asked to submit a report on a project they have undertaken. Eligibilty criteria are currently under review.